What an astute comic this is about change. "Who wants change?" Everyone raises their hands enthusiastically. 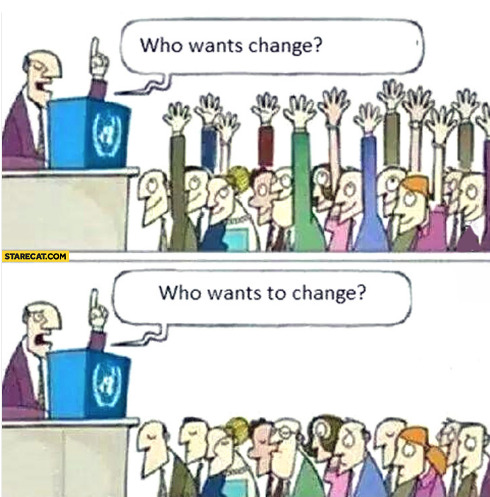 "Who wants to change?" Everyone has their hands and eyes down. I suppose that is the difference between a nice lofty but esoteric concept, and something that actually impacts us and requires our attention, resources, and hard work. So what sounds good for the masses in a speech or article may sound entirely different when applied to the individual. Who me change? No, that's someone else's problem! - Global warming and environmental destruction--that's coming from China now. - Russian aggression in Ukraine, Georgia, the Baltic States--it's a European issue. - The Arab Spring with governments being overthrown and countries destabilizing into sectarian violence--that's for The Gulf States to worry about. - Higher taxes to pay for social entitlements--let the very rich pay for that. - More security and surveillance for counter-terrorism initiatives--let's just surgically target the bad guys with those. Let's face it--we all have a lot on our plates already and we are suckers for a good talking to about some broadly-based, fantastical future that is better, happier, healthier, and more peaceful and prosperous. But what do you have to give up or sacrifice for this future utopia or making progress towards it...ah, that's not a message we really want to get into now, is it?